Are you looking for an amazing mountain holiday tailor-made for you? Well, you've found the right place and friends who will advise you on the best and magical holiday experience in Champoluc. It is the most amazing experience to look out the window and be surrounded by the mystical magic and breathtaking views of the Monte Rosa mountains! The adventure begins with a short walk to the mountains, where all your dreams really can come true! 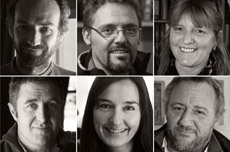 Let us introduce ourselves: we are Andrea, Ivan, Danila, Sandro, Kathrine and Giorgio. We have grown into a group of very close friends over the years via different paths: Andrea and Ivan studied together at collage, Giorgio and Ivan are brothers, Kathrine and Ivan are partners, Sandro and Giorgio met working together in Champoluc and Danila and Giorgio struck up a friendship through a passion for books. We are a mix between locals, some from further afield and former tourists who fell in love with life in Champoluc. Our friendships blossomed between these very mountains. Together we have become a network of inseparable friends who share common passions and are very enthuastic ambassadors of Champoluc. For years we have all shared the desire to be an efficient team. Each skilled in their own field, but with one main goal: to make your holiday an unforgettable fantastic experience. We will listen to your needs and will always be ready to advise you so that you can realize all your expectations. You will discover the outstanding beauty of Val d'Ayas, our traditions and the best recipes from our kitchen, we will make you so welcome so you will really feel one of us, because remember: Champoluc is... living amongst friends! Download the brochure "Champoluc for You" and see a group of friends ready to welcome you!